The real protagonists of change are young Christians and Muslims. Muslim Brotherhood trying to highjack transition. Fear and silence of Church authorities. Accounts of real "national unity". The analysis of a noted political analyst and director of the Jesuit Cultural Centre of Alexandria. 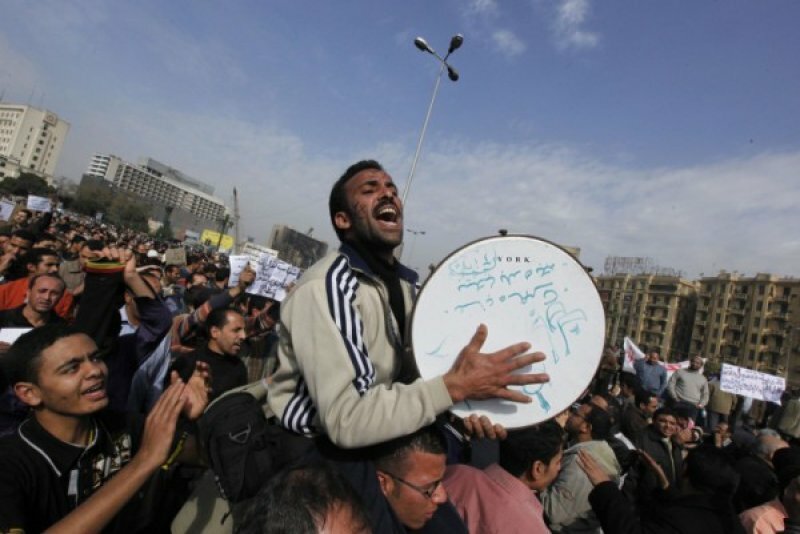 Cairo (AsiaNews) - Fr Henry Boulad, Director of the Jesuit Cultural Centre of Alexandria, and Soliman Chafik, journalist and political analyst, sent us this reading of recent events in Egypt. Predicted, prepared, planned and preannounced, this revolution is the result of a long journey and a long gestation. The first question we must ask is who is behind this upheaval? Who are the real protagonists? The Muslim Brotherhood? Mossad? Iran? America? The West? This or that foreign agent? Or simply that the Egyptian people - a people who had endured too long, suffered too much, borne too much – a people tired of being crushed, exploited, trampled on, and who suddenly exploded? The people ... but which people? Not the little people who always lived in fear and submission ... but some very specific categories: young people, specifically those between 25 and 35, just graduated, and still unemployed, frustrated, unemployed, homeless, without future prospects. These young people beyond a brutalizing scholastic education, beyond empty religious slogans without substance, beyond alienating social and moral constraints, are searching for their own way to give meaning to their lives through the Internet, YouTube, Facebook and Twitter. These young people, with eyes and ears wide open, absorb, consume, assimilate all day and all night everything that today's world offers them on the net ... the best and the worst. These young people, some of whom attend foreign schools or American university dream of openness and modernity. These young people - open, emancipated, capable of reflection and criticism - have dreamed, organized and brought this revolution into the world. But once brought into the world, this revolution has almost immediately been latched onto by the Muslim Brotherhood, who has tried to lay claim to it, to make it a thing of their own, to steal it from the grasp of the young people who are its creators and inventors. So on the one hand we have the young people, the real authors and protagonists of this revolution, and on the other, the Muslim Brotherhood who are trying to appropriate it ... But who else? Are their other protagonists behind the events taking place in Egypt? Certainly there the are men of power, the President in first place, who do not want to give up, leave their posts, who are clinging onto the power they have held for decades by the skin of their nails. This clique, often corrupt, bloated by privileges, rich with billions at the expense of the common people, now feel everything slipping away and are desperately trying to react and cope with the situation. Without doubt this clique is behind the brutal attack on Wednesday, February 5, when thugs equipped with knives and guns, on horseback or on camels, blindly stormed an unarmed crowd that had chosen a peaceful revolution based on dialogue and negotiation. In fact, these brutes appear to not only to be in the pay of the old ruling clique, but also of the captains of industry, commerce and finance who for years took advantage of the "system". This mob will suffer in having to let go of power, and no doubt mobilized these bandits with neither conscience nor creed, to intimidate people and break their determination. Are there any other players? Probably some foreign elements trying to take advantage of the situation to fish in troubled waters. But they are a tiny minority. Finally, there are the thugs, bandits and petty robbers, who looted the shops, burgled the flats, robbed passers-by ... and who would like to see the disorder continue. The army, of course! So far neutral, it is the only guarantor of order. The army is close to the people and an enemy of the Muslim Brotherhood, whom they will strongly oppose should they attempt to seize power. Will we have a new military dictatorship, which would bring us back to square one, namely the coup of 1952? Is it possible? Are there no other scenarios? And the Church in all this? Catholics - hierarchy, clergy, religious and faithful - maintain a prudent silence and take refuge in their churches, masses and prayer meetings. The Coptic Catholic Patriarch breaks the silence with a statement which assures Mubarak of our support and our prayers. The Coptic Orthodox Church, which represents the overwhelming majority of Christians in Egypt, are more divided than ever. At the level of the hierarchy, the race is on for the succession in an end of era atmosphere. For his part Shenouda, also praised the President assuring him of his prayers, in spite of a strong secularist current that rejects his statement and find that he is seriously compromising his position by taking sides. They believe he should adopt a more neutral stance so that later, they will not be accused of collaboration with the old regime. " The majority of Christians, apart from a few activists or intellectuals, have distanced themselves from these political conflicts, and have, it seems, been encouraged to do so by a part of the hierarchy. In reality they live in fear and expect the worst should the Muslim Brotherhood take power. For the moment, thank God, there have been no inter-confessional episodes, although churches and convents are no longer protected by the police. Let us return to the last, and first, protagonist of these events: the people themselves. Taken by surprise by the sudden disappearance of the security forces and the surprising release of prisoners, at first they gave in to panic when faced with the mob of delinquents that was released on the city. But almost as quickly they re-grouped and re-organised to face the onslaught. Civil defence committees spontaneously sprouted everywhere, deploying themselves in front of buildings, on street corners, to defend, protect families and property, to direct circulation and waste collection. This assumption of responsibility by the people is truly remarkable and at the moment everything is being run with a surprising calm, courteousness and efficiency. In a sign of gratitude and recognition, women in the neighbourhood give meals to all those volunteers, lovingly prepared with their own hands. One of them, wanting to pay the butcher to buy meat for this purpose, was told: "Ma'am, how can I accept money for what you do for free for these young volunteers?". I had tears in my eyes listening to this lady who told me about the episode. This "tidal wave" of solidarity at the grassroots level has generated in all levels of society, a brotherhood that has revealed the extraordinary goodness of the Egyptian people. The lady I spoke to told me this: "This is Egypt, these are the Egyptians! Not the ones stealing, robbing, looting, but all these simple-hearted people who only aspire to peace and brotherhood. " Let us hope that the new regime will help us to build, beyond all partisan and sectarian battles, this "national unity" that seems to many a pure utopia. But I believe that the utopia of today may become tomorrow's reality if we really believe in it and if, in order to build it, we invest all our heart, intelligence and energy in it. A prophetic sign of this future harmony was the image this morning in Cairo’s central Tahrir Square of a multitude of people gathered hand in hand and chanting with one voice: "We are all one."